Roszni… Rosavogi… man, Hungarian names aren’t the easiest to pronounce! I’ve been dying to try one of the Rózsavölgyi bars I had noticed at Hilde Devolder’s shop in Ghent. Luckely they are on display, so I could simply point at them, instead of trying to say the name. But take your time, read it slowly and you’ll see the light in that name! So, Hungarian chocolate éh? Well, I didn’t know Hungary had a chocolate tradition either, but when I see Criollo, Porcelana and Madagascar on their website, I’m simply drawn to a shop that sells the wonderful brown gold. Back to the bar, how was it? One thing is sure, the people of Rózsavölgyi sure know how to design a package to make it look appealing. The colour scheme and illustrations give it a real luxurious feel. 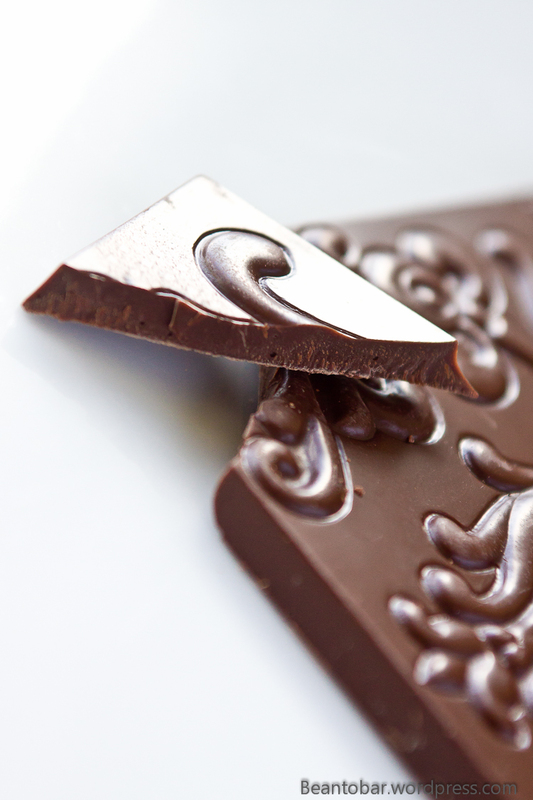 Combined with the graceful writing and the Academy of Chocolate silver award stamp, you almost feel its quality. Opening the package takes time. The dark grey middle band needs to be opened first, by breaking a paper seal. Next is the layer of thick paper with the illustrations. And finally, another layer of packaging paper protects the precious bar. Every single layer has it own seal. A nice touch. 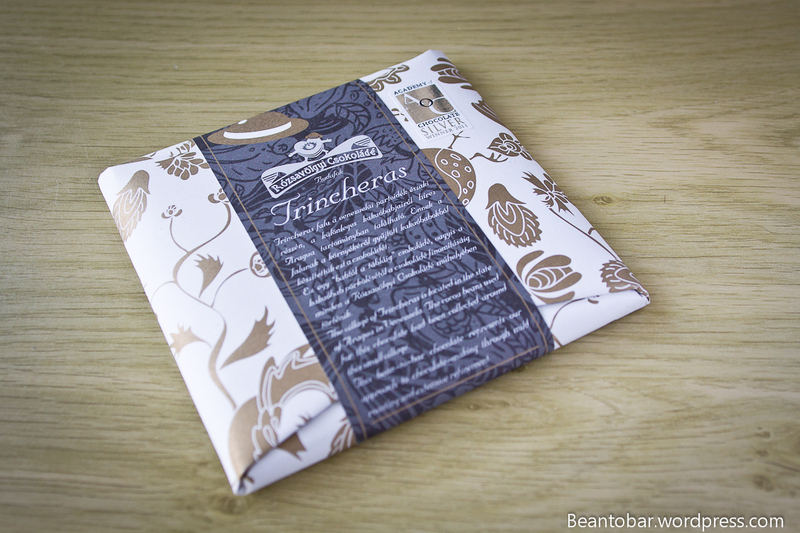 The package reveals the chocolate has been made with cacao beans harvested around the village of Trincheras in Venezuela (the heart of THE quality cacao terroir in the world). 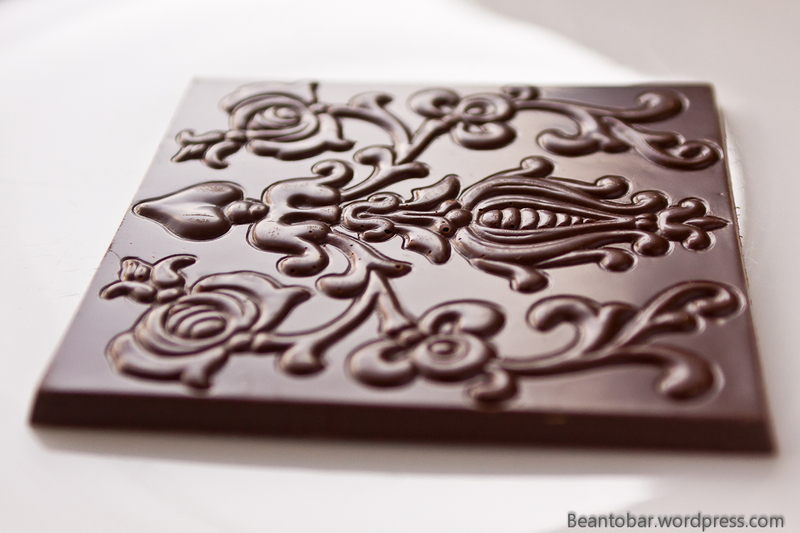 Further more you’ll read it reflects the vision of Rózsavölgyi on chocolate making, meaning light roast and refinement. Next come the bar itself. What a beauty she is. 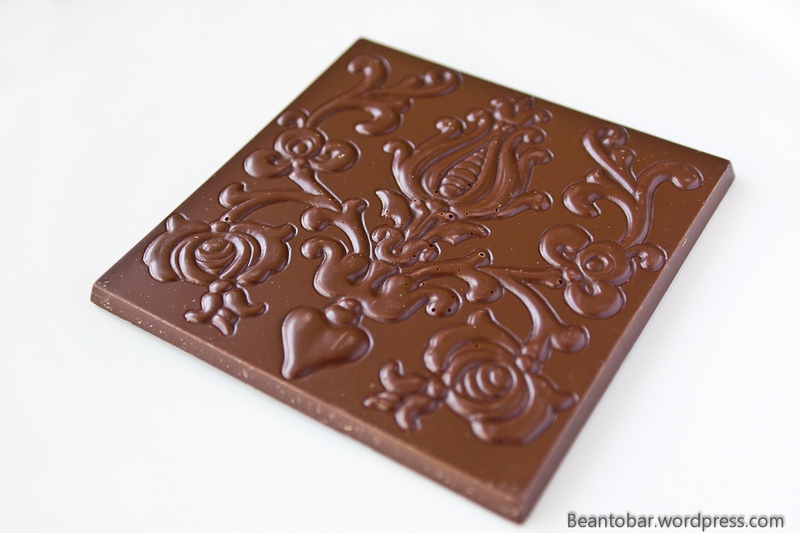 A nice slab of amazing smelling chocolate, decorated with an almost royal embossment. A pity there are some air bubbles visible, but still, you just look at it, wondering (once again) what a shame it will be to break of a piece. But one must eventually, drawn in by the promise of superb chocolate. Colour: A lot lighter than I intentionally expected, a nice deep maroon-brown. Aroma: slightly spicy, dark in nature, some raw chocolate aroma’s come through. Taste: a slow but sweet opening chocolate, delivering a massive thundering wave of dense chocolate tones. Afterwards, some of the raw cacao tones as smelled come forth, including a dash of bitterness, though nowhere near as intense as 100% chocolates. The light roast sure helps to preserve the freshness you experience. The sweetness keeps it very enjoyable, without being to clingy or overwhelming. Hints of red fruits remain in the back, more complementing the aroma than crying attention. Spicy tones can be discovered too, reminding me of gingerbread and cinnamon, adding warmth to the mix. And suddenly it became clear to me, the resemblance to Valrhona’s El Pedregal. 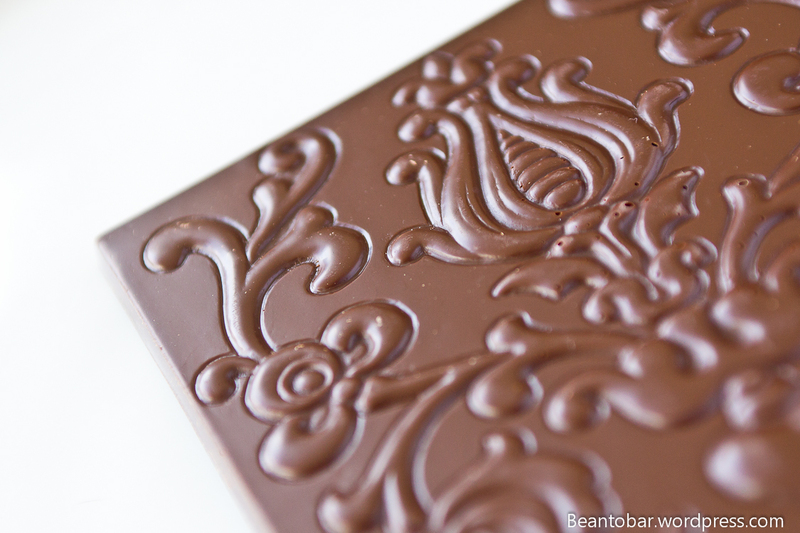 This chocolate also develops wine like tannine aroma’s at the end, allowing a fluent transition to the aftertaste once the chocolate has gone. The aftertaste is not the longest around, but it adds some more tannin and a green fresh cacao zing to the mouth, while it slowly dissipates. It won’t throw many different taste tones at you, this bar rather lets the aroma develop, starting from a sweet cacao aroma, peaking like a wave, while the other tones surf along and blend in. Wonderful and complex, yet soothing at the same time, begging to be tasted again, so you can discover new subtleties. Should make for an excellent chocolate to end a frantic day, enjoying some precious moment of time for yourself. Makes one dream about the other offerings of Rózsavölgyi Csokoládé. Also a favorite for me from the Rözsavölgyi chocolate makers. Nice comment Kris!